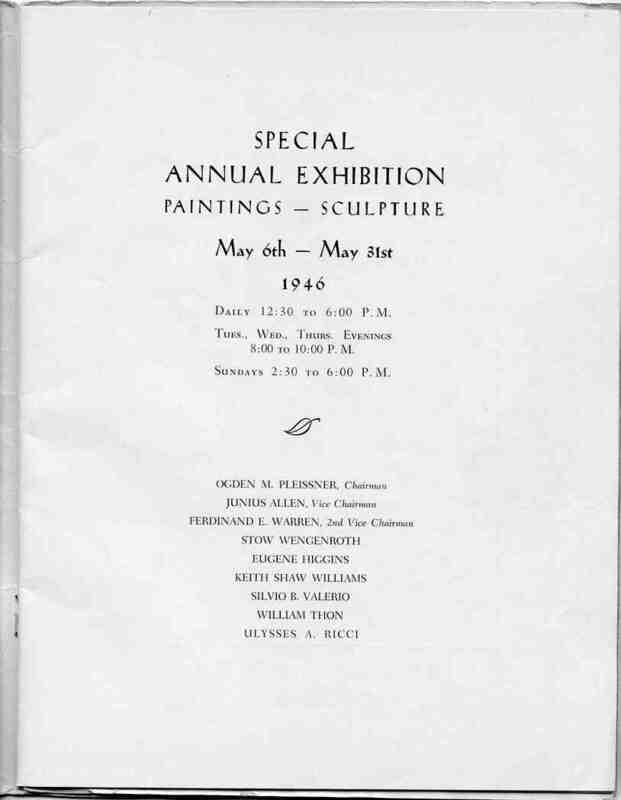 Thanks to Seth Bogdanave, grandson of the late A. J. Bogdanove (RA-1934) we have a scan to share of the membership roster included with the catalog of the 1946 (75th Anniversary) Annual Exhibition. The only member of the flock from that year who is still with us is Loring Coleman (NRA-1941), currently residing in Cambridge, MA. This entry was posted in Memorabilia. Editor’s Note: Seth sent me the scan that I posted (i.e. he did the grunt work). I’d love to post more items like this if anyone has and would send in scans. Billy, I don’t know what Bob Mueller has in the club’s (Curator’s) possession in terms of this kind of material but if you have a list of items in your possession you might email it to him (before these things vanish). I’m still sitting on a stack of old Salmagundians and Stews I have to scan but haven’t had time (sorry, Ruth). Thanks so much to Seth! I love that we have these, & would love to browse through them. But the scans are so small I can’t read a single name — is there any way to enlarge the images? My plus key doesn’t seem to work on this. Beth, you can download the images by right clicking and saving. Then enlarge when you open.